Guala was one of the first disciples of Saint Dominic, attracted by the Dominican ideal in 1219, when he heard the founder preach. He received the habit from Dominic at the time the friary opened in Bergamo. After a short novitiate, he was appointed prior there. Guala proved to be an able superior and a practical administrator and builder. He was on the committee that planed the convent of Saint Agnes in Bologna. During a delay in the construction of the convent because of the opposition of the family of Blessed Diana d’Andalò, who was financing the project, Guala was sent to Brescia to assume the position of its first prior. During this period Guala had the revelation of Saint Dominic’s greatness that became the subject of many early legends. Although they were good friends, Guala did not know that Dominic was dying on their return from a chapter. Guala had fallen asleep with his head leaning against the belltower of the conventual church at Brescia when he had a vision of two ladders coming down from heaven. Our Lord was visible at the top of one ladder, and Our Lady at the top of the other. Angels were ascending and descending on them. As Guala watched, a friar, who sat at the foot of one ladder with his face covered was drawn up to heaven and great glory surrounded him. 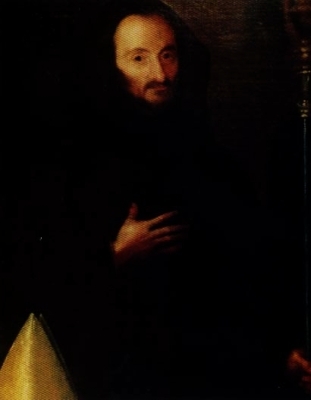 Guala awoke, deeply affected by the vision, and went immediately to Bologna, where he found that Saint Dominic had died at the time of his vision. In 1226, Guala was named the prior of Bologna’s Saint Nicholas abbey, famous for its regularity and fervor. While there, Pope Honorius III appointed him arbiter between Bologna and Modena. Guala worked hard to forge a treaty that lasted 10 years. The following year Pope Gregory IX asked him to negotiate between Emperor Frederick II and the Lombard confederacy–an even more daunting diplomatic task. Guala was also commissioned to convince Frederick to keep his vow to lead a crusade. He was unable to resolve matters between the parties, but at least they maintained the status quo of an uneasy peace. In 1228, Guala was consecrated bishop of Brescia. As such, he negotiated a number of treaties between warring cities. Frederick broke all the promises he had made and attacked the cities that had remained loyal to the pope. In 1238, Frederick’s army besieged Brescia, but the attackers had to withdraw within three months, which is credited to Guala. The years of labor and civil strife wore him down. He resigned his see in 1242 in order to enter complete seclusion and pray without interruption in preparation for death. Therefore, he retired to the Vallumbrosan monastery of San Sepolcro d’Astino, where he lived as a hermit until his death. He was buried in the Benedictine church, and after many miracles at his tomb, his cause was promoted. Beatified: cultus approved in 1868 by Pope Pius IX.